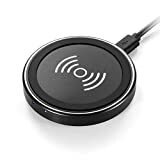 When you buy a wireless charger for your desk at home or in your office, you definitely want to get one with fast wireless charging support (like this one, which is only $9.99). But when you’re getting a wireless charging pad for your night stand or dresser to charge your phone overnight, who cares how fast it charges? Save some money with Amazon’s back to school sale on the insanely popular Anker Wireless Charging Pad. Use the coupon code ANKERBTS at checkout and you’ll only pay $7.99!